In the report Byers and Webb conclude that: The A/OPS are compromise vessels that will be ineffective in the Arctic and too slow and unstable for offshore patrol functions along the Atlantic and Pacific coasts. They will cost 8 to 10 times per vessel what Australia and the United States are paying for purpose-built high-speed patrol ships and that further compromises can be expected, as the Department of National Defence struggles, within a budget that was set in 2007, to complete the procurement of vessels that are based on an entirely new design. 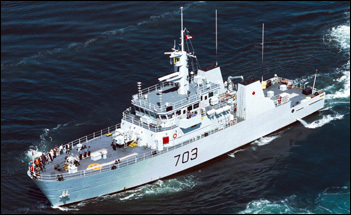 They make a number of recommendations, including: Canceling the procurement of Naval Arctic/Offshore Patrol Ships, procuring 6 to 8 purpose-built high-speed offshore patrol ships based on a proven design and rebuilding the Coast Guard icebreaker fleet to take into account changing ice conditions and the need for the vessels to fulfill an additional, constabulary role. A relatively dispassionate review of this paper can be found at the Naval Review website. (3) The authors content themselves with pointing out the large number of technical papers and the apparent misunderstanding by Byers and Webb of the concepts of operational requirements and design compromise. They also observe that even if the paper does not, or can not, answer the questions it raises, the questions need to be asked. In general Policy should inform requirements and in turn requirements should drive procurement. Canadian Defence Review has often pointed out the errors involved when this process is derailed. In its worst form, equipment available will influence policy. That is, we end up doing that which we have equipped ourselves to do, not those things that we wish to do. The goal of the Rideau Institute is to reverse this paradigm and use procurement to drive policy. Having failed to convince a working majority of Canadians of the worthiness of their aims the Institute, and the people around them, hope that by limiting the capabilities of the Canadian Armed Forces they can limit the ability of the nation to achieve policy goals that the Rideau Institute does not approve of. One would think that if the Rideau Institute had faith in their own goals then they would have more faith in the Canadian public. Canada needs to have open, transparent, discussions about policy, about where we want to go and how we want to get there. What we don’t need is back room maneuvering and ingenuous “suggestions” designed to achieve policy goals by forgoing the awkwardness of engaging other citizens in the discussion.